Ignoring Friction: Are Cell Phones Linked to Brain Cancer? On Thursday, September 25th, Congress heard the widespread concerns that cell phones could possibly lead to brain cancer. There are many conflicting thoughts about the long term effects of frequent cell phone use. Dr. Ronald Herberman, the director of the University of Pittsburgh Cancer Institute, went in front of Congress to testify. He believes that long term cell phone use may be directly linked with brain cancer. “I cannot tell this committee that cell phones are definitely dangerous. But, I certainly cannot tell you that they are safe,” he said in front of the House Subcommittee on Domestic Policy. 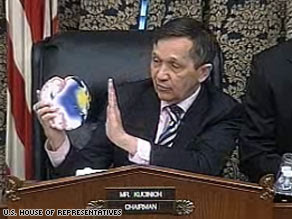 Rep. Dennis Kucinich, pictured below with a simulated brain radiation model of a young adolescent, led the hearing (Landau). A study out of Orebro University in Sweden has indicated that using cell phones doubles the chance of developing malignant brain tumors. It also increases you risk of developing acoustic neuromas. Acoustic neuromas are tumors that appear on the hearing nerve in your brain. Those under the age of 20 and using cell phones regularly are more than five times more likely to develop brain cancers. This study, however, has not been published in a peer-reviewed journal, which means that the scientific community has not had a chance to agree with the findings. More research is definitely needed because this research was done on a small scale and could have possibly been biased or not fully developed. Many global health organizations, like the US Food and Drug Administration, the World Health Organization, the National Cancer Institute, and the American Cancer Society, have come to an agreement that there is no reason for immediate concern. They do not believe that the study showing significance is statistically accurate beyond a doubt (Landau). The American Cancer society has yet to come out with conclusive evidence for or against cell phones causing cancer, but they assure consumers that there is no positive evidence towards it yet. Cell phones should not cause cancer because they do not emit ionizing radiation (Cellular Phones). They have teamed with the Federal Communications Commission and have put out a statement confirming that if there is a risk, it is probably very small. There have been a few case-controlled studies in the United States that have generated promising results. The first studies showed that patients with brain cancer did not show any more cell phone use than the patients without brain cancer. There was also no correlation with a tendency for brain cancer to increase with the increase in cell phone usage. Finally, there was no relationship with the side of the brain tumor and the side the patients would hold the phone up to (Cellular Phones). 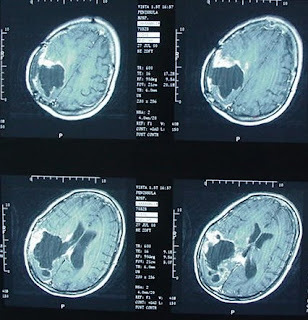 These results are hopeful that there will not be a large increase in brain tumor patients within the next few years, though I am sure many more studies will be done on this given the increased media attention! "Cellular Phones." Prevention and Early Detection. 28 May 2008. American Cancer Society. 27 Sept. 2008. Available http://www.cancer.org/docroot/ped/content/ped_1_3x_cellular_phones.asp. Cohen, Elizabeth. "5 Tips to Limit Your Cell Phone Risk." CNN Health. 28 Sept. 2008. Available http://www.cnn.com/2008/health/07/31/ep.cell.phones.cancer/index.html. Landau, Elizabeth. "Scientists debate possible cell phone link to brain cancer." CNN. 25 Sept. 2008. 27 Sept. 2008 Available http://www.cnn.com/2008/health/09/25/cellphones.cancer/. Not all cell phones cause cancer. Just those that play Hannah Montana songs when they ring. Also cell phones that ring during class have been know to cause D's.